Day 64 of the 90 Days of Awesome is in the bank! What made today awesome? I got to catch up with my friend Kolby Granville. 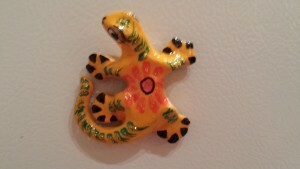 Kolby brought me this cute magnet back from his trip. I’m not sure what to call this little guy. Kolby is a fellow lawyer and runner and also a high school teacher, so his schedule allows him to take a three-week vacation in the summer. He just got back from spending the three weeks in South America and Mexico. Kolby and I got to hang out this afternoon for a bit and I got to live vicariously through his travel stories. He told me about the places that were so dangerous that he couldn’t leave the tourist areas, the amazing ruins he got to climb, and the beautiful islands where he went scuba diving. It was fun to hear about his adventures, especially when he got to hang out with the locals and go to places where they used golf carts instead of cars for taxicabs. The other upside of hanging out with Kolby was I got to play with his cats. I’m definitely more of a dog person then a cat person, but his cats are pretty cool. They are sweet girls who troop over to me when I walk in the room and rub themselves all over my legs and bag. One of them likes to lick my hand. It’s pretty cute. In case you missed it: Day 63 of the 90 Days of Awesome – I got to have lunch with my sobriety siblings!